Omit final travel move if last wall line segment is too thin to print. a move will be done anyway. Some notes about this: According to Ghostkeeper, this should be using coordinates, as well as the global resolution parameters. Some notes about this: According to Ruben, this should be using coordinates, as well as the global resolution parameters. Not sure I understand what you mean by using coordinates. As for the global resolution params, I don't think they are accessible in this method, are they? I can't recreate the situation that made me want to filter out the tiny fat line segments right now but I am sure that I added that because I was seeing a problem. I don't think I just put it in from the beginning in the hope that it would be useful. Not sure I understand what you mean by using coordinates. Makes sense regarding the line segments. For me it's OK because it's logical, but was still worth asking. Ah, understood. I've made that little change. Use coord_t rather than int64_t. Overall I would've thought that it would be simpler to implement this. You already know the flow, so instead of this one addWallLine call you could simply call addTravel. I don't see why this needs to be implemented in this way with the travel_required flag. We have a function getSettingAsRatio which does exactly what you need. You should square this and compare with vSize2(p0 - p1) for performance. I think that this was a much nicer/simpler solution than the business you have below with the first_line boolean variable. Why was it removed? Because, before, it would always do the first travel even when the whole wall is not printed because all the line segments have a flow that is too low. You only want to do the initial travel move if there are any segments that are to be printed. It seems illogical to set some travel_required variable here rather than just travelling immediately to p1. 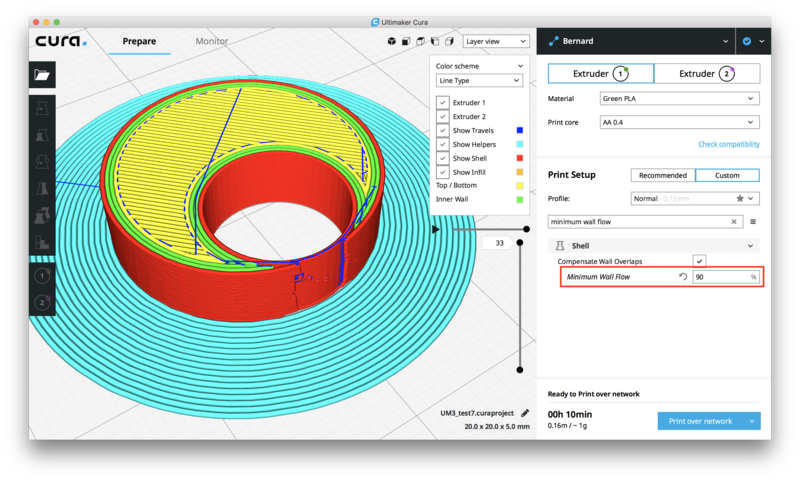 addWallLine is not called if the line is smaller than 50 microns now (unless it's the first line). That's true - I suppose you could get a first line printed that is shorter than 50 microns that you would otherwise not print but I don't think that is very likely and even if you did print it, so what? This one is still a bit of a problem because its possible to try and print a circle in which all the lines are less than 50 microns. I mean, unlikely because people often post files with stupidly low resolutions online, but it could happen. Then we'd end up skipping all the entire shape. OK, I'll take the fat line avoidance stuff out for you (and keep it for me). Use getSettingAsRatio() rather than getSettingAsPercentage() / 100. Save time by using vSize2f() rather than vSize(). This is ready for a re-review? Just spoke with @Ghostkeeper and we're still concerned about one point. Remove the hack that avoids printing spurious short segments. This was requested so that people can happily print walls with sub-50um lines. Hi Ian, I have removed the hack so people can now happily print walls with lines < 50um long. You will, of course, now get spurious travels to random points on curved walls but, hey, that's a small price to pay. Hi Ian, don't agonise about it. Go with how it is now and in the event of it being a real problem think of that as an incentive to fix the overlap compensation! Yeah I guess neither is very common but we'd rather have small spurs that can be trimmed off with an x-acto knife than holes or a missing wall in the case of a chain of 50 micron . "Chain so light when a breeze roll by, man it flow-ow-ow, man it flow-ow-ow;"
Hi @smartavionics , why are the settings Minimum Wall Flow and Prefer Retract under Compensate Wall Overlaps? Because they are only relevant when the walls are being reduced in width by the overlap compensation. If there's no overlap compensation, all walls will be 100% of their normal width. We've discussed it and decided that the settings are not actual sub settings of wall overlap compensation (but related to), we're putting it just below. Visibility is the same as before. OK, that's fine. Will you still hide them when the overlap compensation is disabled? Yes, as you said these settings wouldn't make sense if overlap compensation is off.